According to Engadget reports, Motorola Xoom 2 will be available in Ireland this chrismas, priced at 399.90, around $545, for the WiFi-only edition with 16GB of inbuilt storage. But unlike the rumor said that, it doesn’t run Ice Cream Sandwich, just with Android 3.2. Xoom 2 has a 8.2 inch touchpanel, is different with the original 10.1 inch. It’s unexpected. Currently, 10.1 inch screen has widely used by tablet manufacturers. And people prefer to enjoy movies on a bigger screen. Maybe Motorola just take this one to make up market defect. Some people just need this size, neither too large nor too small. Up to now, there is few information about this tablet on the internet. Other rumored specs include a front-facing camera, Bluetooth, and GPS. Hope it just like Carphone Warehouse said, “everything a tablet should be”. When smart phone has entered the “dual-core times”, Motorola demonstrated very positive attitudes to this situation. Despite has already released the variety of smart phones equipped with dual-core processor, but Motorola’s new round of “dual-core offensive ” has begun to mobilize. Recently, Motorola cooperate with Sprint U.S. carrier has officially released the latest dual-core smartphone - Photon 4G. Many people have bored with the same shape of most android smartphones, the MOTO Photon 4G just show Motorola’s strengths in the industrial design, its angular corner design not only full of personality and full of masculine, giving us a very deep impression. In fact, this product can be considered almost a “shedding of making”. Although the type and name changes, but Motorola Photon 4G can actually be seen as recently released a new version of MOTO DROID X2, the main difference is that the phone is customized for carrier Sprint and add WiMAX network support, can bring more faster download speed and smooth internet experience. 1GHz dual-core processorMotorola Photon 4G is also equipped with a 4.3-inch capacitive touch screen, and supports qHD (960 × 540 pixels) specifications, large touch screen and a finer display will bring better visual experience. But compared to MOTO DROID X2 capacity of only 512MB of ROM, Motorola Photon 4G capacity this will be upgraded to 1GB, will lead to smoother control speed. The machine is also loaded with 1GHz frequency of the NVIDIA Tegra 2 Duo processor, and ultra-low power integrated NVIDIA GeForce graphics processors, the maximum can achieve double browsing speed and hardware accelerate Flash function, that allows users to enjoy HD gaming experience. Posted in News -	Tagged 1GHz dual-core processor, 4G network, Cool shape, dual-core, Photon 4G. According to media reports, in the MWC Mobile World Congress, 2011, Motorola said, Xoom today in the second quarter will be sold in the European market. Motorola Xoom offers 3G + WiFi versions of tablet, in addition will also provide only support for WiFi version and the version provided is similar to iPad, estimated the price of WiFi version will be lower. 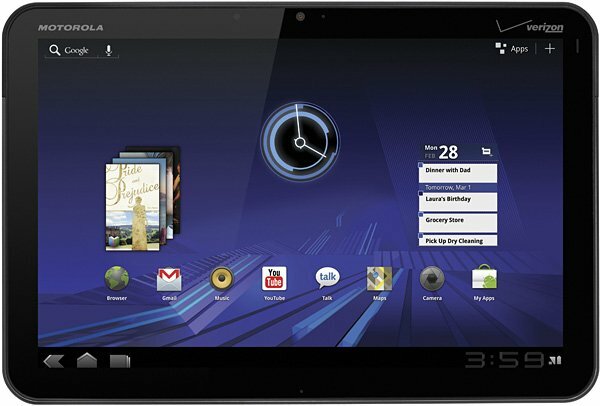 Motorola Xoom uses a 10.1-inch screen with a resolution of 1280 x 800, with dual-core processor clocked at 1GHz, the configuration of 500 million and 200 million dual cameras. Run Android 3.0 operating system. Xoom will also provide a standard base plate, in the provision of charging at the same time, with the external speakers you can watch videos or enjoy music. Based on the high-definition speaker you can transfer the HD contents directly to television, with the built-in speakers you can also enjoy music. In addition, Motorola also offers a standard Bluetooth wireless keyboard attachment, which used Shortcuts optimized design of Android system .